Last Friday I received an email alerting me to the National Anthem YouTube Singing Contest sponsored by the Smithsonian’s National Museum of American History and USA Weekend Magazine! My correspondent asked if I would share this information with The Daily Flag readers, and I am happy to do so. Entries for this contest will end on April 13. The winner will be invited to perform the national anthem at the museum and at the Baltimore Orioles vs. Atlanta Braves game in Baltimore on Flag Day, June 14. The links below will tell you how to enter the contest. Long-time Daily Flag readers will know that I am a purist about our National Anthem, and if my advice is worth anything, then this is it: If you want to enter this contest, then sing the Star-Spangled Banner with all your heart, and all your soul. Tell the story like it was the first time anyone was hearing it, and take us back to that morning in Baltimore harbor. After a decade’s conservation, the flag that inspired the National Anthem returns to its place of honor on the National Mall. Long before it flew to the moon, waved over the White House or was folded into tight triangles at Arlington National Cemetery; before it sparked fiery Congressional debates, reached the North Pole or the summit of Mount Everest; before it became a lapel fixture, testified to the Marines’ possession of Iwo Jima, or fluttered over front porches, firetrucks and construction cranes; before it inspired a national anthem or recruiting posters for two world wars, the American ensign was just a flag. For the rest of Robert M. Poole’s splendid story in Smithsonian magazine, go here. On Wednesday, President George Bush and First Lady Laura Bush dedicated the renovated National Museum of American History. Today is the grand opening to the public, with retired Gen. Colin Powell scheduled to read President Abraham Lincoln’s Gettysburg Address. The original Star-Spangled Banner—the one that flew over Fort McHenry and inspired America’s National Anthem—had long been displayed in the museum, but for the past ten years it has been in the hands of conservationists, who have carefully preserved the fragile flag. Now it is beautifully displayed again in a specially designed gallery and enclosure that will protect this national treasure. All photography from the Smithsonian web site. In Part 1 of this series, I wrote about the differences between the National Anthem Committee (NAC) adopted protocol for the National Anthem, and the law subsequently passed by Congress a few months later. The differences are striking and if you missed it, stop and go read it. Style over substance is the topic de jour—looking at the current trend of performers and their renditions. Here is part of The Code for the National Anthem of the United States of America adopted by the National Anthem committee in April of 1942. … Since the message of the music is greatly heightened by the text, it is of paramount importance that emphasis be placed upon the singing of the National Anthem. … It is inappropriate to make or use sophisticated "concert" versions of the National Anthem. …The slighting of note values in the playing or singing of the National Anthem will seriously impair the beauty and effectiveness of both the music and lyric. There are several things about the flag business I enjoy, but one stands above the rest. When I introduce myself to people and tell them what I do, they smile. Not that big toothy grin you sometimes see, but a gentle smile where the ends of the lips turn up. In sales for many years, I haven’t always gotten such a reaction. Many time people weren’t as happy to see me, but out of necessity utilized my products. Flags are different. Most people have a positive response with positive images coming to mind. We are introduced to the U.S. flag in grade school (sometimes before) and hearing the stories about it, pride builds inside for this symbol we hold dear. Pay close attention to the fifth and sixth lines—that our flag survived this major attack and was still flying was a tremendous victory. What a great story to remember when thinking about the flag. Later in the poem, Key mentions first light and the confusion surrounding what was happening. It’s a real history lesson all its own. 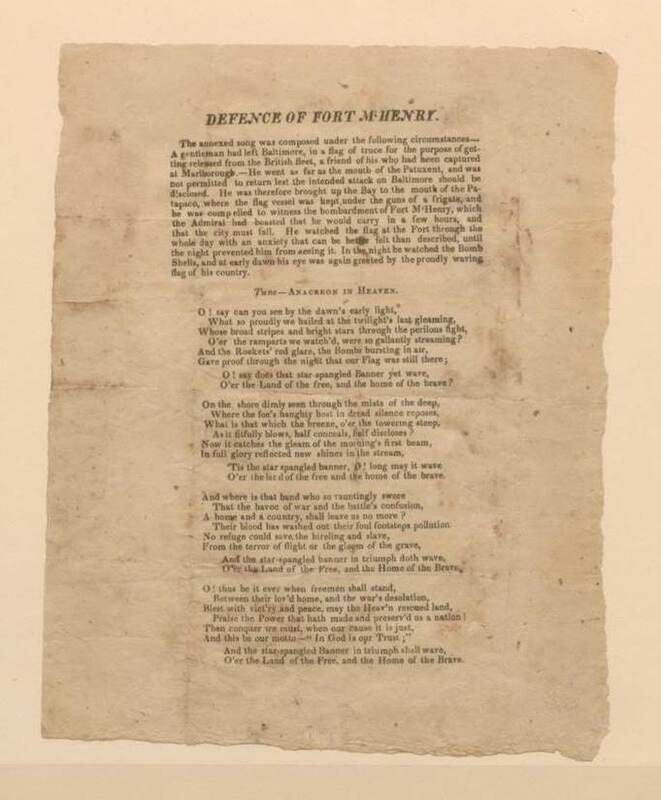 In fact, I included the entire text for the Star Spangled Banner with another article. Read it though and tell me it doesn’t make you smile. In honor of Washington’s Birthday, here is the entire poem written that historic day in 1814. For more background and a great history lesson, more information can be found here. Recent high-profile sporting events left me wondering about the protocol for the National Anthem, like the one for the Pledge of Allegiance in the U.S. Flag Code. Easy enough, but what about protocol for the National Anthem? I began at Google and started searching and discovered a lot of information that couldn’t be verified. I kept digging. I located one site that “claimed” to quote the U.S. Flag Code as found on the American Legion website. It contained a section that wasn’t in my copy of the U.S. Flag Code, so I went to the American Legion website to see which version of the Flag Code they were using. It turned out they are using the same one I am, and there is no reference to the National Anthem contained in the Flag Code. I did find a section on the Legion site titled National Anthem and it did reference the U.S. Code, Title 36, Chapter 10, Section 171 for the proper protocol. Then to confirm, I went to the U.S. Government site containing the United States Codes and dug into Title 36. This brought up the next hurdle. There was no Chapter 10. WHAT? EUREKA! The research paid off in a big way and here is what I located. There it is. The elusive National Anthem protocol. Now when you attend that next concert, ball game, or school event, you will know the proper conduct when they begin playing the Star Spangled Banner. Here is the rest of the information in this Chapter of the United States Code. “In God we trust” is the national motto. The flower commonly known as the rose is the national floral emblem. The composition by John Philip Sousa entitled “The Stars and Stripes Forever” is the national march.